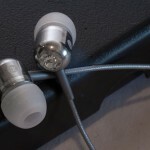 BassBuds: Great Sound, but where’s the volume control? Listening to my favorite music, I heard notes and tones that I had never experienced before. I expected quality sound from these ear-buds, but BassBuds exceeded my expectations..